Ship’s bells have always had a special significance since they were used to mark the passage of time at sea. 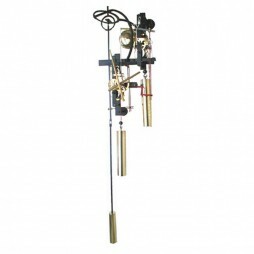 Thanks to modern technology the unique sequence of chimes employed to note hours and minutes on ship can also be reproduced by a clock. 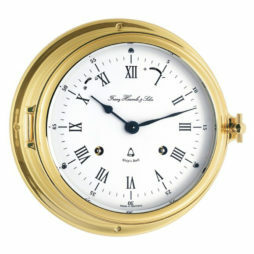 The solid brass Norfolk Ship’s Bell Clock is a perfect example of one which does so to perfection and is a must have for anyone interested in keeping track of the time continuously. 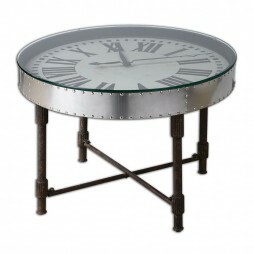 This unique piece of home dcor is both a table and a clock all in one! Bring the essence of comfortability in a modern way when you add this unique wall clock. The streamlined simplicity of this sturdy cabinet is both elegant and beautiful. It compliments the stonewashed patina over fir wood that helps create a comfortable, rustic feel. This unique clock table has well-designed gliders and stoppers in each drawer. It is beautifully accented by original style, oil-rubbed bronze bin pulls. This unique modern table clock is the definition of state-of-the-art design. It’s unique look will make a lovely piece of home decor you and your guest will love. Ships bells were traditionally used to mark the start of a watch on a ship. An integral part of life at sea, this practice still continues today. Thanks to modern technology the same process can be replicated with a clock, making it really easy to know what time it is as the sequence of chimes is followed. That is what makes the chrome plated Southampton Ship’s Bell Clock a must have for anyone interested in being able to keep track of the passing hours. 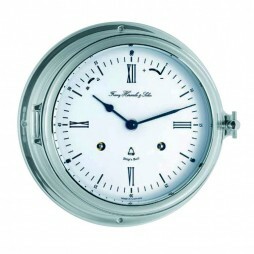 The clock which features Roman numerals against a white face surrounded by a chrome bezel, also comes with a jeweled 8-day mechanical ships bell movement with a shut-off. 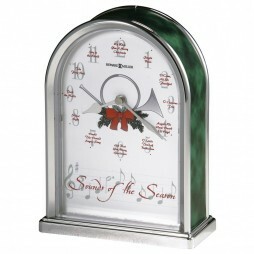 Enhance your holidays with the festive melodies of the Sounds of Season Christmas Clock! This beautiful timepiece features a silver-finished arch with green marble-tone sides and a white dial with silver-tone hands, Arabic numerals and a traditional horn with holiday greenery. Enjoy a new song each hour including Jingle Bells; O Come All Ye Faithful; O Christmas Tree; Angels We Have Heard On High; O Little Town of Bethlehem; God Rest You Merry, Gentlemen; Hark! The Herald Angels Sing; Silent Night; Deck the Halls; The First Noel, Joy to the World and We Wish You a Merry Christmas. Perfect for the avid bird watcher! 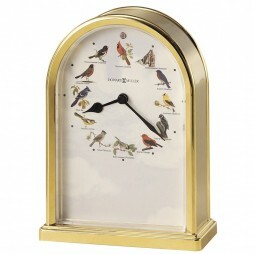 Each hour, the Songbirds III Table Clock will play the song of a different bird including Northern Cardinal, White-breasted Nuthatch, Eastern Bluebird, American Goldfinch, Downy Woodpecker, Scarlet Tanager, Black-capped Chickadee, Tufted Titmouse, Northern Oriole or Blue Jay. The volume is automatically reduced at night. This Beautiful timepiece is finished in polished brass with a white dial, light-blue sky silhouette and renderings of each of the birds. A large and impressive piece, this clock is more a timekeeping sculpture than a mere clock. 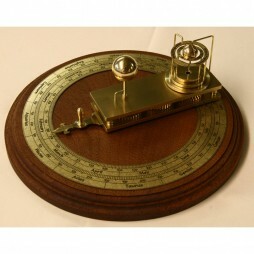 Gift yourself a unique astronomical device; the Fergusons Orrery Astronomical Device commissioned by Sternreiter and made entirely in the U.S.A.
Adorning an elegant and solid mahogany and brass finish, this device gets a premium and rich look. The solid brass mechanism rests on a fine piece of solid Mahogany. This device might seem to be a complex one, but is just as simple. Simply move the lever to the correct date and find the correct position of the earth on its axis, in relation to the sun and moon. The premium construction gives this device a sophisticated appearance. Most of today’s advertised products are mass-produced; a carbon copy traded from store to store, delivered to house after house. For this reason, it’s hard to find those specialty items that can set your home apart from all the rest. Well we understand the need for individuality. And thankfully, many clockmakers who enjoy their craft do as well. This notion has led many experts in the field to create some incredibly distinctive pieces. So why do people spend the time and energy making such intricate and detailed designs? Aren’t clocks merely used to keep track of time? The creative vision of timekeeping devices has been around for centuries, from the origin of the sundial to the mechanical key-wound variety. So it stands to reason that such a contraption should advance and evolve as the years pass. And clock enthusiasts and engineers alike understand that clocks and watches are some of those classic items that get passed down from generation to generation. They can reach a level of vintage charm and sentimentality among the likes of classic cars, grand pianos, or even fine china. Specialty clocks can hold special meaning for different people, especially when they become a part of the family. Don’t you want to find a specialty clock of your own to share in your home? One that you can pass along to your loved ones someday? Browse through our exclusive collection of fine assorted clocks and timepieces, and start a new tradition within your family. Each of our specialty clocks is its own unique piece, made from only the most dedicated and imaginative clockmakers from around the globe. 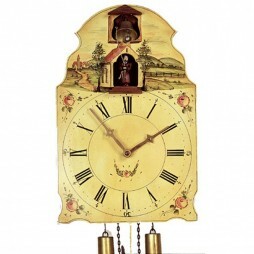 Consumers wanting to find original furnishings for their home is not a recent phenomenon, even when it comes to clocks. In today’s world, finding rare items to decorate our homes is its own kind of industry in the making. Many who hunt down antiques and collectibles are hoping to find hidden gems for various reasons. However, many do it for the sake of uncovering pieces that can’t be found (or bought) anywhere else. Being the masters of invention that they are, many clockmakers have always experimented with new techniques in clock engineering as well. Finding that perfect blend of function, mechanism and design becomes the highest priority. Looking back through history, clocks viewed on towers throughout Medieval Europe even included uncommon components like astronomical indicators or mechanical figures of people and animals. Mythological tales and images of historic icons would be on display. The aristocracy during the Renaissance period would even commission rare masterpieces from clockmakers to adorn their estates. They would sometimes incorporate very realistic features such as actual singing birds, figures whose eyes would blink, or ships that appeared to actually be sailing. Clearly, specialty clocks have been around for centuries, and they haven’t stopped being a popular request to this day. Therefore, we here at Expressions of Time have amassed a lovely collection of rare and unique items, all selected from reliable brand names in the business. Give your home that added spark of originality, and take pride in knowing your living space hasn’t fallen the way of the masses. 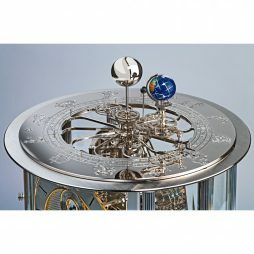 ClockShops.com has a reputation for only selling the best of the best. We convene with the experts to acquire the most precious designs and styles, ready to deliver to each and every one of our favored customers. Take our L’Epee collection, for instance. 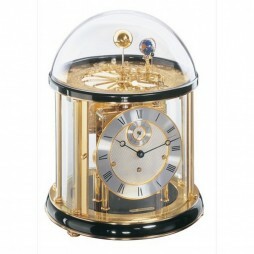 We have an assortment of L’Epee carriage clocks in stock, such as the Ovale Swiss-Made Gold-Plated Carriage Clock. Each one is notable for being its own majestic piece of art. 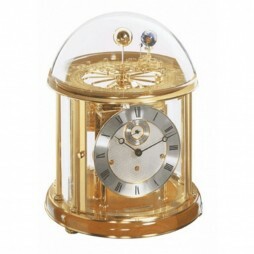 This specialty clock, framed in an elegant golden finish, was hand-made in Switzerland. It only signifies just how precious this hot commodity is to buyers. Emphasize this stunning piece in your home today! Your children will want to savor this heirloom for years to come. 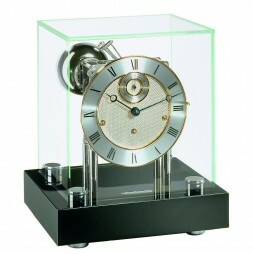 Or go for an L’Epee model that’s more chic and modern, like the La Tour Noire-Palladium Table Clock. This contemporary beauty has a vertical slant to its stature, all fashioned together into an upward-flowing blend of mechanical parts. The monochromatic colors and skeletonized movement inside the protective glass-casing is a visionary delight. Still haven’t found what you’re looking for? 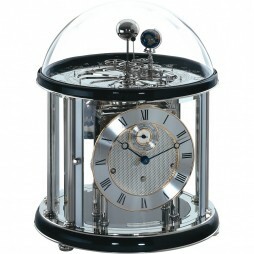 Try a specialty clock from the Hermle series of Tellurium timekeepers. Replicating the quintessential mechanical work of 18th-century clockmaking with a modern twist, the Hermle Tellurium Clock II can never go by unnoticed. A pure vision of artistic decadence, the Tellurium model actually displays the movements of the Earth going around the Sun. Combining the average instrument for telling time with such distinctive features has never looked so mesmerizing. We also have a lovely collection of others, including Bulova and Howard Miller designs that you simply can’t miss. 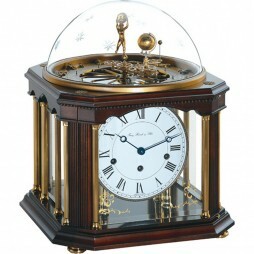 So take the time to explore ClockShops.com, and find your family’s new favorite keepsake. Isn’t it about time you had something special to show off in your home? Well you don’t have to wonder any longer! Simply check out what Expressions of Time has to offer. You’ll be amazed by all of the sophisticated and unique pieces on the market these days. You won’t be able to settle on just one! 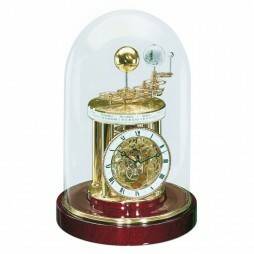 Many of these specialty clocks are imported from around the world individually after each purchase. We take great care in handling our products, and do a full inspection of each instrument to ensure there are no damages. After all, we understand what it means to fall in love with a specialty piece. So you can always expect excellent customer service and all the help you could possibly need in making your final decision. Find your perfect specialty clock today!